The new WordPress block editor is on its way, and although it won’t officially be available until WordPress 5.0 is released, the Gutenberg plugin is available for you to start testing right now. 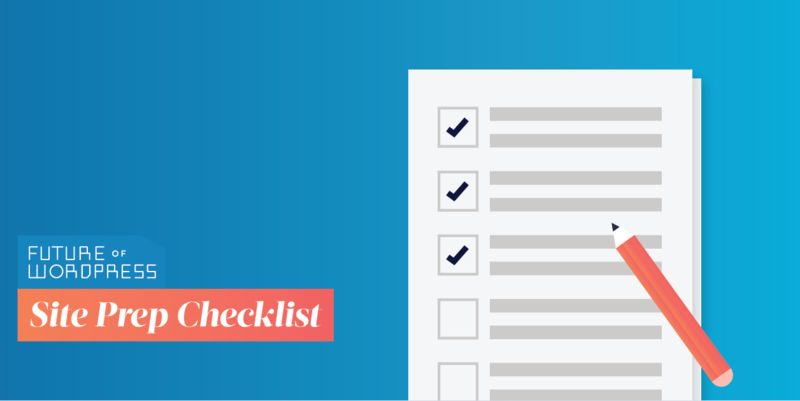 If you haven’t started testing the new block editor yet, this step-by-step checklist will help you get your site ready to rock WordPress 5.0 when it arrives. A staging site is basically a copy of your site where you can test changes so you don’t accidentally break your live site. Because it’s an exact duplicate of your site’s server, settings, and content, you can see how the new block editor will work on your specific site. And if there are any conflicts or bugs, you’ll be able to identify and fix them before you roll out any changes on your live site. If you’ve already got a staging site set up, go ahead and move on to step two. If not, we’ve got a staging site setup guide to get you started. To test the block editor on your staging site, you’ll need to install and activate the Gutenberg plugin. This plugin is not just a simulation of the block editor—it’s the literal code that will be merged into WordPress Core and become the real block editor when WordPress 5.0 is released. So when you test it out, whatever you experience will be an accurate representation of how the block editor will behave on your site. Step #3: Have Some Fun! Once you’ve got the block editor plugin installed, get in there and create something awesome! In addition to building a new page or post, you can see the difference between editing existing posts in the block editor vs the classic editor. By default, all existing posts will open in the block editor. Pro Tip: Once WordPress 5.0 is available, you’ll want to repeat your testing using the core 5.0 update in place of the block editor plugin before updating your live site. Now is the time to proactively test plugin and theme integration with the block editor. While WordPress 5.0 updates the core WordPress software for your site, plugin and theme updates are handled individually by their respective authors and you may see different levels of compatibility based on the specific plugin or theme. Many plugin authors have a page on their website to share updates on their compatibility progress and goals. This is where you’ll typically find opportunities to test any beta versions or extensions they’ve made available. Shameless humble brag: users of The Events Calendar (that’s you!) can experience the new block editor for events right now by downloading our Events Gutenberg extension. If you haven’t already done so, research your site’s theme and plugins to see if there are any concerns about how they’ll be affected by the block editor. This is especially important for anyone using a “page builder” theme—try to learn as early as possible if you will need to change your theme or make any adjustments to ensure it continues working well in WordPress 5.0 and beyond. Unfortunately, there are some themes and plugins that won’t be compatible with the new block editor when it arrives (but don’t worry, The Events Calendar will be 100% compatible). As you’re testing the new block editor on your site, it won’t be uncommon to run into problems. That’s a good thing because it gives you a chance to contact support and resolve those issues before you deploy updates to your live site. Pro Tip: Our Testing for Conflicts guide can help you determine whether the issue is a conflict or legit bug. Once you’ve sussed that out, you can report issues on WordPress.org, the Gutenberg GitHub repo, or with a specific theme author as needed. Remember, the Gutenberg project is actively under development. It’s entirely possible parts of the block editor implementation may change before WordPress 5.0 is released. Bonus—you can also check out our block editor news page for details on the latest developments and our FREE Guide to Gutenberg ebook! Now before you go off and start rocking the new block editor, make sure you sign up for our newsletter to get the latest news, updates, and release date announcements.